Chocolate Dipped Rolo Stuffed Nutter Butter Cookies - can use sprinkles or chopped peanuts instead of white stripes. Great for tailgating!!! Always gone in a flash. We love this easy no-bake dessert recipe! One of my favorite quick desserts are my Homemade Twix Bites. They are Ritz crackers stuffed with a melted Rolo candy. They are so good! Sweet and salty! I was brainstorming for football recipes and wanted to do something with Nutter Butters. I decided to stuff them with Rolo candies and decorate them like footballs. I think they turned out SO cute! They also taste incredible! I couldn't stop eating them. the combination of peanut butter, chocolate and caramel is perfect. 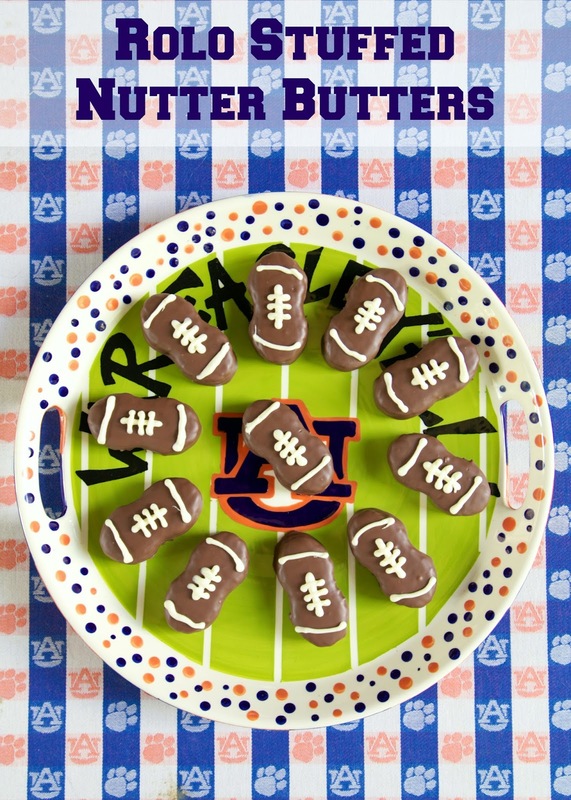 Of course, you don't have to decorate them to look like footballs, but I was serving them at a tailgate, so I did. These would also be good sprinkled with chopped peanuts or sprinkles for the holidays. Carefully separate Nutter Butter cookies. Place cookie halfs with least amount of peanut butter on a baking sheet. Top with two Rolos. Bake for 3-5 minutes, until chocolate is soft and not melted. Top Rolos with reserved second Nutter Butter. Cool completely. Once cookies are cooled. Melt chocolate candy coating according to package directions. Dip each cookie into candy coating, shaking off excess. Allow to dry on wax paper. Melt white candy melts according to package directions. Pour in squeeze bottle. Add stripes to each dipped cookie. Allow to set up before serving. 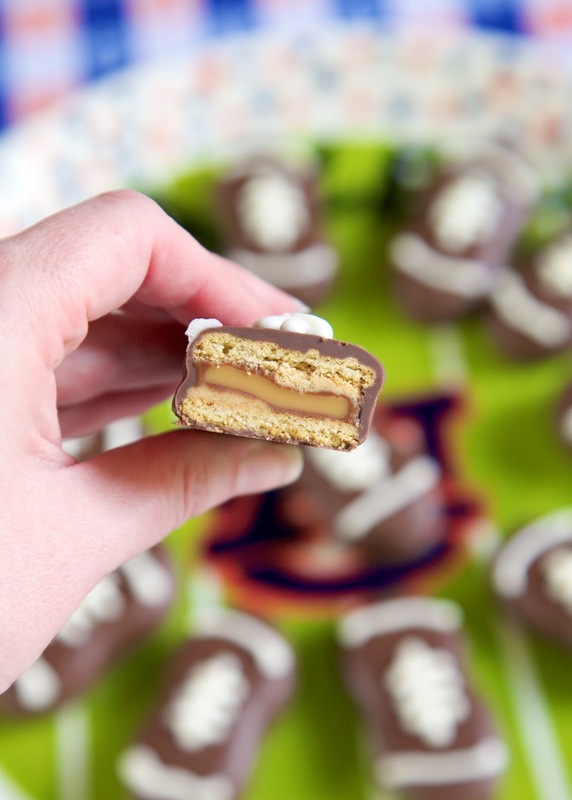 I made these for my Super Bowl party and, well...I'm not so good with candy coating, and they were kind of a mess. So we just called them Tom Brady's Deflated Balls! Everybody thought that was hilarious. They also thought the cookies were delicious and devoured them! I also made your Creole Green Beans last night and I have a new favorite side dish!